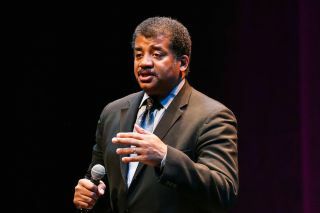 Astrophysicist Neil deGrasse Tyson will host a three-hour discussion on "The Search for Life in the Universe" in Asbury Park, New Jersey on Friday (Dec. 15) at 8 p.m. EST, and Space.com is giving away two free tickets! To enter the contest, visit Space.com's Facebook page, find our post about the giveaway and post a comment with a cool satellite image of Mars. Whichever image receives the most "likes" by Thursday (Dec. 14) at 3 p.m. EST will be deemed the winner. The two tickets are valued at $98, and the cost of travel to and from the event is not included in the giveaway. You can find more information about the event at apboardwalk.com/event/evening-neil-degrasse-tyson and more details about the contest in the official rules below.